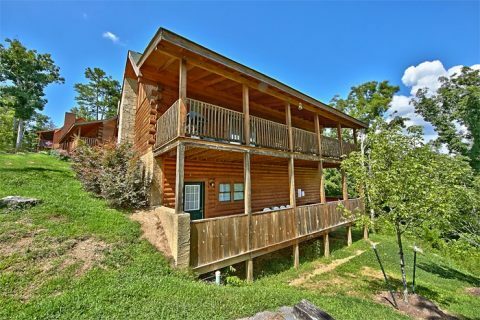 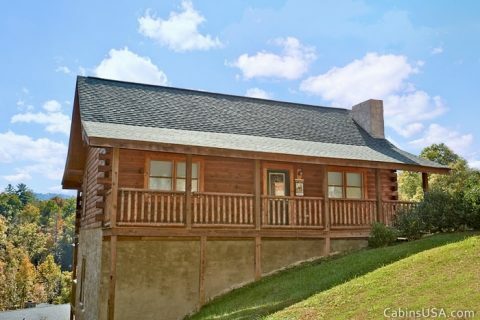 Check out this lovely cabin for rent in Pigeon Forge! 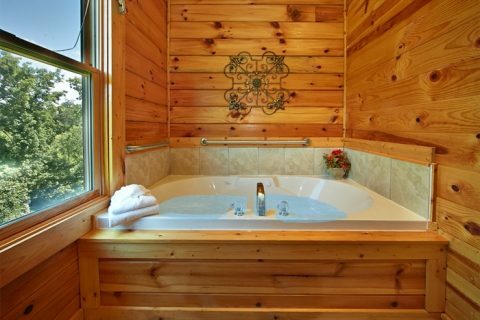 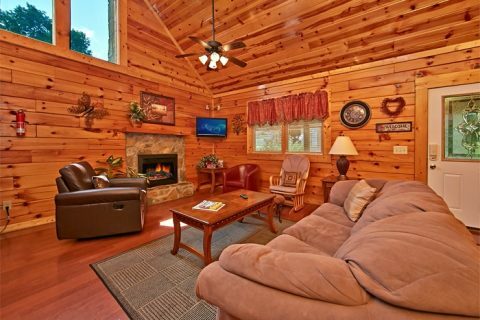 "Autumn Ridge," a luxurious two bedroom cabin, gives guests a chance to truly relax in the pristine beauty of the Smoky Mountains. 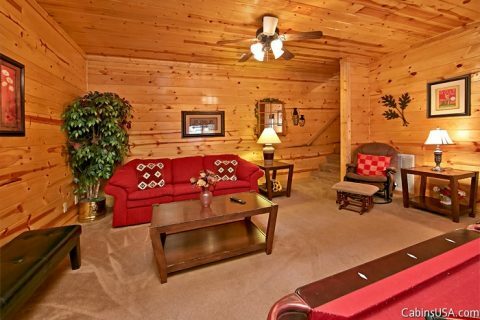 With a convenient location and spacious interior, this cabin in Pigeon Forge is the perfect lodging for a vacation of a lifetime. 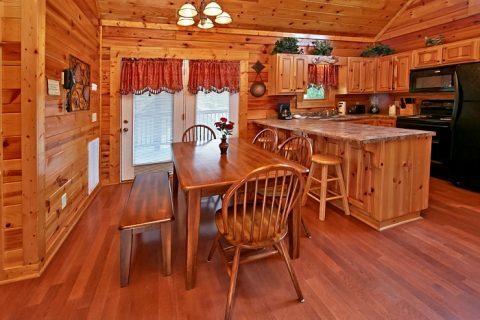 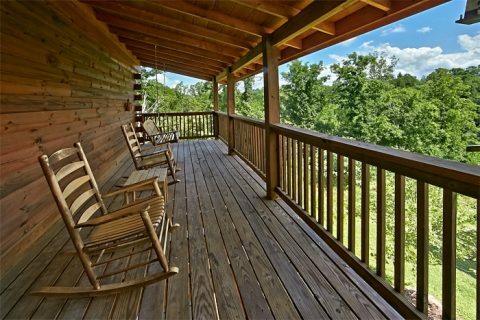 Guests enter this cabin for rent in Pigeon Forge on the main level with an open living area with a comfortable sitting area center around the fireplace, a kitchen with plenty of counter space to prepare elaborate meals, a handsome dining set, and beautiful hardwoods throughout. 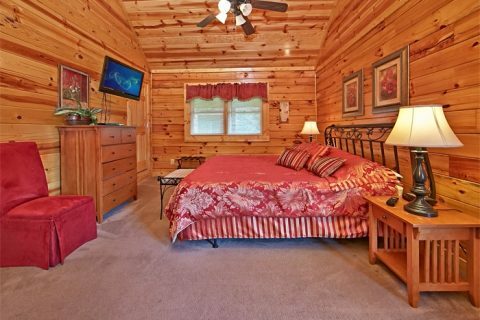 The main level's king bedroom contains an in-room jacuzzi tub, a flat-screen television, and a comfortable king-size bed for a relaxing night in the Smokies. 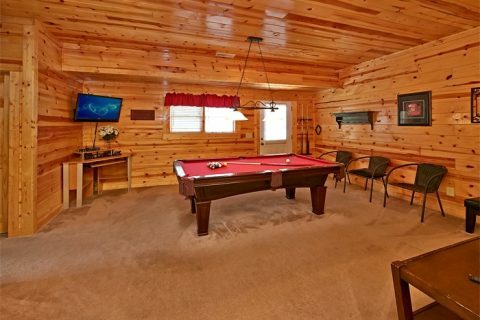 Downstairs, the cabin's game room provides all the entertainment you need for nights spent in the cabin, while another bedroom offers a king-size bed, a flat screen television, and its own bathroom. 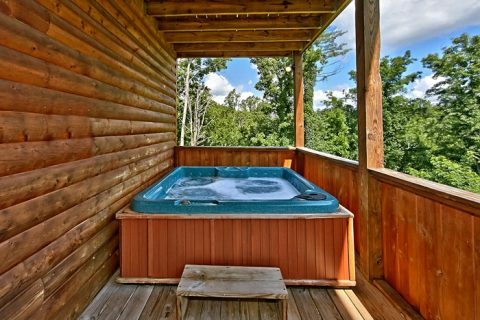 Outside, a large year-round hot tub invites guests to relax in its warm waters while the chef in the family cooks delicious burgers on the gas grill. 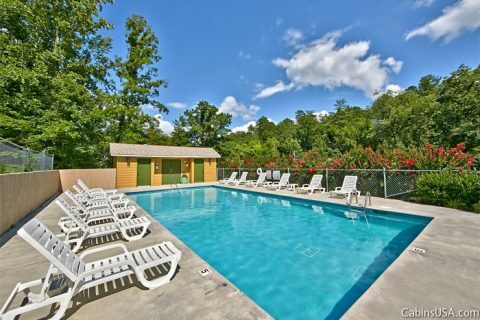 This cabin in Pigeon Forge provides you with resort swimming pool access and a convenient location that places guests less than a mile off the action-packed Pigeon Forge Parkway, where everyone can enjoy seemingly endless attractions! 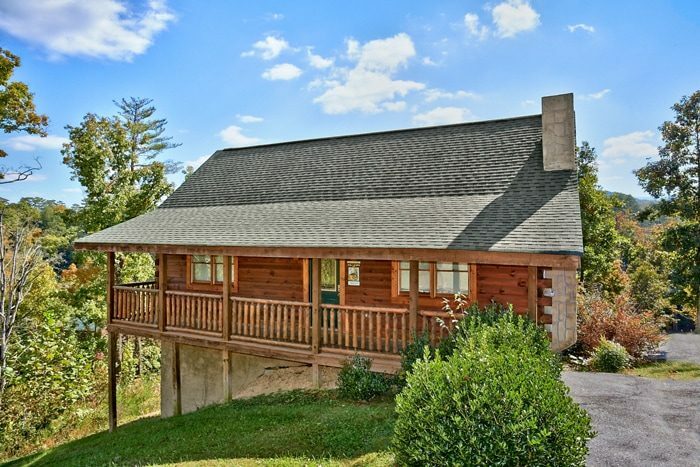 Additionally, this is perfect Pigeon Forge vacation rental for motorcyclists touring the Smoky Mountains with plenty of flat parking area for the bikes and lots of room for your group to relax after a day of riding the roads through the Smokies. 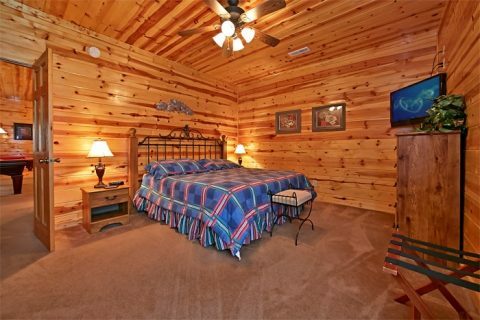 Searching for "cabin rentals Pigeon Forge" night and day? 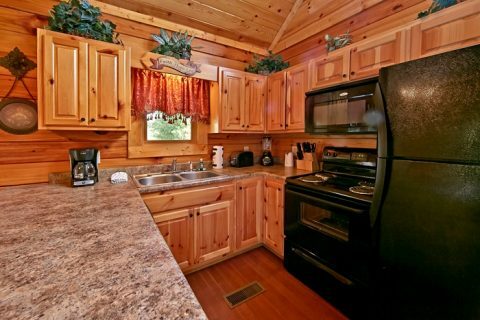 Book this cabin for rent in Pigeon Forge online with Cabins USA and receive an immediate Online Cabin Discount. 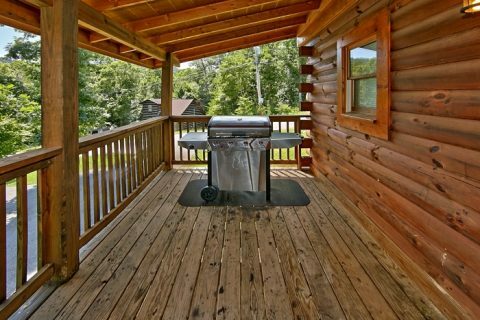 Come enjoy the Tennessee Smokies in affordable cabin style while having adventure after adventure in the beautiful Pigeon Forge Smoky Mountains!